The South Bay Dressage and Horsemanship clinics with Terry Church are hosted by the lovely NCEFT hippotherapy facility in Woodside, CA. While following the more traditional 45 minute private (or semi-private) lesson format, the South Bay clinics are equally designed to help horses and riders at all levels of dressage, as well as helping to improve performance for eventing and hunter/jumper riders, and those in Western disciplines. Using a mindful and relationship-based approach, Terry Church brings over 30 years experience to starting young/green horses as well as working with horses in competition. Horses with training issues and troubled histories are also welcome. 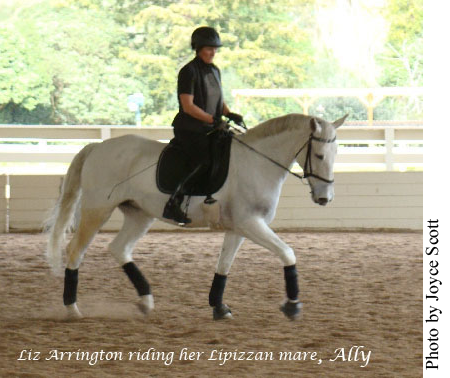 A USDF Bronze and Silver Medalist and FEI level dressage rider and trainer, Terry uniquely combines the often overlooked benefits of good horsemanship with classical dressage to help both enthusiast and serious competitor establish the kind of partnership that allows each horse to reach its potential while maintaining the ability to enjoy its work. Building on more than seven years of intensive work with Tom Dorrance (a seminal figure in the world of what is commonly referred to as "natural horsemanship"), she excels at establishing relaxed and trusting partnerships between horses and riders that allow for accelerated learning and students who are empowered to develop their own feel and think for themselves. Depending on the goals of each horse/rider combination, ground work as well as work under saddle can be incorporated into each session. Lessons may also be combined and adjusted in length to suit the needs of each participant. View photos of each group by selecting the blue links!